We recently checked this book out from the library – I’m not sure who picked it out, because when it comes to my 4-year-old, it’s a big hodge-podge of stuff she likes the covers of and things my husband or I intentionally seek out for her. However we got our hands on it, I’m glad we did! The artwork throughout is beautiful and eye-catching, and the text is beautifully simple; it’s easy enough to read to my toddler. 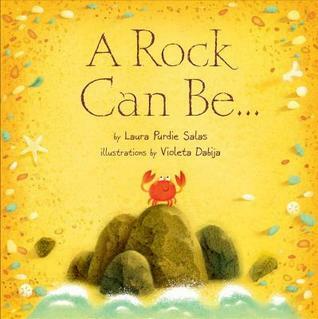 At the end of the narrative, there are several pages over which the author explains each iteration of the rock throughout the book, which was wonderful to read/talk about with my 4-year-old. There’s also a glossary of terms at the very end, and I’m working on convincing my almost-7-year-old that she would actually find the book interesting (she’s skeptical of most anything she doesn’t pick out herself).